I am writing now from the marvelous Netherlands Institute at Athens (NIA), where for the past days I followed a beginner’s course in Modern Greek, furnished by an organization called ‘Taalhuis’, which is established in Amsterdam. 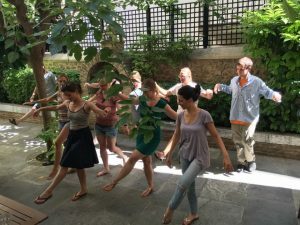 My aim is to gain some capacity in the language, to help navigate Greek archaeological sites and administrative issues – and of course to get to enjoy Greek culture more fully. Our wonderful teachers Angeliki and Myrthe ruthlessly immersed us in the modern Greek world and lifestyle, teaching us in Greek in the morning and having us make homework assignments until early evening, before taking us on outings where we were, exactly, expected to communicate in Greek. I have to say the experience was exhausting, but also quite rewarding, since in little more than a week, I feel like I have acquired at least a basic understanding of the language. It will take a lot of practice before I will actually be able to communicate effectively, but at least the day-to-day dealings at restaurants, museums, supermarkets and other stores hold no mysteries for me any more. 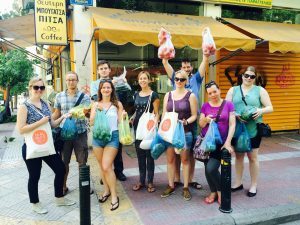 Highlights of the course were the cooking lesson provided by Angeliki’s (Greek) mother, preceded by a trip to the market where we were expected to buy the ingredients for our meal ourselves. Under Mama’s expert supervision, we cooked delicious γεμιστά – filled vegetables, in our case tomatoes (ντομάτες) and bell peppers (πιπεριές), accompanied by tzatziki and the compulsory choriatiki salad. 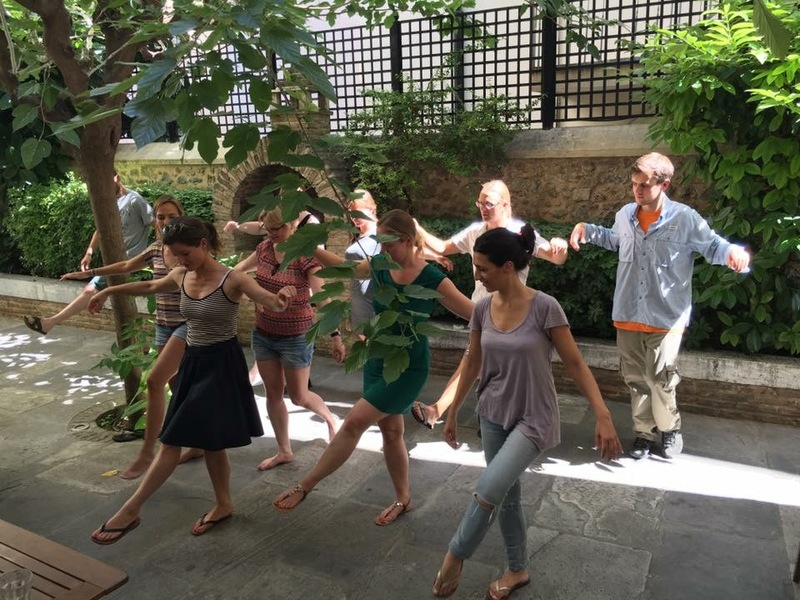 After dinner, we were treated to an informal lesson in Greek folk dancing by Georgía, a friend of our teachers’. The course is over now, and I am leaving tomorrow. Taking advantage of the fact that I was traveling to Athens anyway, I arrived here a week before the course, which additionally gave me the chance to work on my theoretical framework on the function of inscriptions in polis society. 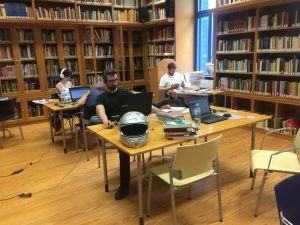 The various libraries of the foreign institutes here provide an excellent environment for study, with all the literature you could wish for up for grabs. I found especially the library of the Britisch School an excellent environment for me to study in. During the course, I also managed to meet with my third supervisor, Graham Oliver, who is normally situated at Brown University (in Providence, RI, in the States), but who was here to teach his annual epigraphy course at the British School. It was very good to meet in real life, after having had some conversations over Skype in an earlier stage. Graham is extremely knowledgeable about Hellenistic epigraphy, Greek cities and Asia Minor in general, which allows me to test some of my theories and thoughts against his expertise. We also discussed the possibility of me coming to visit Brown University for a little while in the near future. All of this goes to show how fruitful a stay in Athens can be for research: besides all the great libraries, it’s also a hub for everyone who works on Greek history and archaeology to meet and interact (as, one might argue, it was in antiquity!). But it’s back to the Dutch summer now, hoping that the Greek language and tempo of living stay with me. Staying at the NIA and in Athens was great once again and I especially enjoyed reconnecting with my Athenian friend Alexandros, as well as meeting all the new people at the course and at the institute. A final word goes to Konstantina, a wonderful young Greek artist and archaeologist who was also staying at the NIA, and with whom I quickly became friends: she showed me some of the greatest Athenian times, and I hope we stay in touch.